In this study, hollow mesoporous silica nanoparticles (HMSNs) were synthesized using the sol-gel/emulsion approach and its potential application in drug delivery was assessed. The HMSNs were characterized, by transmission electron microscopy (TEM), Scanning Electron Microscopy (SEM), nitrogen adsorption/desorption and Brunauer-Emmett-Teller (BET), to have a mesoporous layer on its surface, with an average pore diameter of about 2 nm and a surface area of 880 m2/g. Fluorescein isothiocyanate (FITC) loaded into these HMSNs was used as a model platform to assess its efficacy as a drug delivery tool. Its release kinetic study revealed a sequential release of FITC from the HMSNs for over a period of one week when soaked in inorganic solution, while a burst release kinetic of the dye was observed just within a few hours of soaking in organic solution. These FITC-loaded HMSNs was also found capable to be internalized by live human cervical cancer cells (HeLa), wherein it was quickly released into the cytoplasm within a short period of time after intracellular uptake. We envision that these HMSNs, with large pores and high efficacy to adsorb chemicals such as the fluorescent dye FITC, could serve as a delivery vehicle for controlled release of chemicals administered into live cells, opening potential to a diverse range of applications including drug storage and release as well as metabolic manipulation of cells. For many years, silica has been employed as a versatile and relatively benign material in material sciences and engineering due to the variety of available chemical and physical modifications that it offers as well as the biocompatibility feature that it display. It is thus not surprising that silica nanoparticles have recently emerged as an attractive and widely used chemical/drug delivery vehicle for basic research and clinical trials. In fact, amongst these carriers made of silica, hollow spherical silica nanoparticles with mesoporous walls stands out as a class of nanomaterials with many distinctive advantages, such as having a non-toxic nature, good surface permeability, large specific surface area, tunable pore structures, excellent physicochemical stability and chemically modifiable surfaces, all of which allow them to be potential hosts for various chemical agents/therapeutic drugs. These hollow mesoporous silica nanoparticles (HMSNs) are especially useful when used to host therapeutic compounds such as enzymes that are easily degraded in the hostile biological environment when delivered per se without encapsulation. Besides encapsulation, these therapeutic agents can also be covalently attached, or adsorbed onto such silica nanocarriers that has been pre-surface modified. Indeed, these approaches can easily overcome drug solubility and stability issues, besides having control over the rate in which the drugs are released. Thus, wide attention has been placed on the recent application of HMSNs in the field of biomedicine, including its use as novel materials in catalysis, separation, cell-labeling and capsule agent for drug delivery [1, 2]. To date, a number of approaches have been employed to fabricate oxide and sulfide hollow spheres [3, 4]. Deposition of silica layer on latex or colloid templates and subsequent removal of the hard templates by calcination or corrosion has been known to be the conventional approach for preparation of HMSNs [5–7]. Sol-gel/emulsion method, in which the emulsion droplets are thermodynamically stable and uniform and act as templates for the growth of silica, has also been developed as an alternative method for the preparation of HMSNs [8–13]. The formation of hollow silica spheres by a soft templating scheme depends on the stability of the surfactant organization, and interfacial deposition of silica to form the nanoshell. In recent years, a variety of emulsion systems, such as water-in-oil , oil-in-water [15–18], water-oil-water , oil-water-oil , and supercritical CO2-in-water [21, 22] have all been adopted for the preparation of HMSNs. However, uniformity of the size and shell thickness of the hollow silica spheres prepared by the emulsion method are less satisfactory than those obtained from the hard template method due to the dynamic character of the emulsion droplets [23–25]. It was speculated that for oil-in-water emulsion system, introduction of another solvent that has good compatibility with both water and TEOS, for instance ethanol, might be helpful in improving stability of the oil droplets and thus monodispersity of the resulting hollow silica spheres. In this work, we looked into the potential biomedical applications of HMSNs prepared by a sol-gel/emulsion (oil-in-water/ethanol) method. The use of ethanol is to improve the stability of the oil droplets, thus allowing the preparation of hollow silica spheres with improved size distribution. Here, the fluorescent dye FITC was chosen as a model cargo of the HMSNs for easy visualization of its release behaviour from the nanomaterial both in different solutions as well as upon uptake by cells. The possibility of combining both bioactivity and chemical agent release behaviour can make these HMSNs as an ideal tool for use in drug delivery application. Figure 1 shows representative TEM (Figure 1a and 1c) and SEM (Figure 1b) images of the silica spheres prepared under a certain ethanol-to-water ratios and 5 mM CTAB concentration. These images revealed that the spheres retained their intact spherical nature even after calcination at 600°C for 6 h. The spheres appear hollow in character and have an average diameter of about 200 nm. Importantly, Figure 1c also revealed that the shell display a mesoporous structure that is ordered in the short range and have a shell thickness of about 20 nm. Additionally, as these particles were dispersed in water prior to their observation under electron microscopy, the images captured also demonstrated that the nanoparticles were well dispersed in water, thus providing maximal interface to carry optimal amount of chemical agent for delivery. TEM (a) and SEM (b) images of HMSNs. TEM image of the shell of a HMSNs at high magnification is shown in (c). The BET surface area of these HMSNs revealed a relatively high value of 880 m2/g as shown in Figure 2a, thus presenting these nanoparticles as an ideal material for hosting guest molecules of various sizes, shapes and functionalities. Their pore size distribution as depicted in Figure 2b showed a wide distribution, with a sharp peak observed at around 2 nm, thus suggesting a mesoporous reactive layer formation at the particle surface. Indeed, formation of these mesoporous structures are highly favoured as they have a high surface area and large pore, which allow chemical agents to be hosted within them in the nanoscale porosity, thereby enhancing the capacity for drug adsorption. N2 adsorption/desorption isotherms (a) and BET pore size distribution plots (b) of the calcined HMSNs by a sol-gel/emulsion method. The kinetics of FITC adsorption on HMSNs is as shown in Figure 3. FITC dye dissolved in acetone at a concentration of 1 mg/mL was mixed with HMSNs at different concentration for several days in order to observe the relationship between time and concentration of particles. The data seemed to suggest that there is a two-step loading pattern observe with all nanoparticle concentration, with a rapid absorbance of the dye attained in the first 24 h and a second relatively slow loading phase occurring in the subsequent two days. 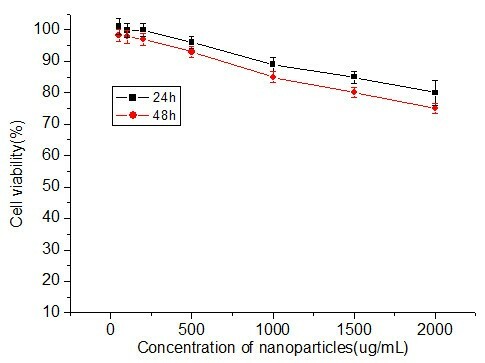 It demonstrated the absorbance of FITC to mesoporous silica nanoparticles is correlative to time point in 24 h. The equilibrium capacity at 24 h was 19.95, 54.68 and 60.97 μg of FITC per mg of nanoparticles for 1, 5 and 10 mg/mL of HMSNs, respectively. This indicates that the binding of FITC is dependent on the concentration of HMSNs, as seen by the higher adsorption amount of FITC onto the HMSNs at nanoparticle concentrations of 5 and 10 mg/mL than at 1 mg/mL, altogether suggesting that the encapsulation of FITC is a diffusion-driven process. Taking this result into consideration, we have chosen 5 mg/mL of nanoparticles as the concentration that is optimal for loading of FITC in all subsequent experiments. Kinetics study of FITC adsorption on HMSNs at different nanoparticle concentration. Insert displays a photograph of HMSNs before (white color) and after (yellow color) soaking in FITC-acetone solution. The release studies of FITC from HMSNs (5 mg/mL) at room temperature were conducted either in inorganic solution such as PBS (pH5.2), RPMI 1640(pH7.4) or organic solution such as acetone. RPMI 1640 (pH7.4) was used to assess whether fluorescent dye could be released from HMSNs before their entry into cell. A pH value of 5.2 was chosen to mimic the physiological pH values inside endosomes. Figure 4 shows the cumulative release kinetics of FITC from HMSNs. The release rate of FITC from HMSNs in acetone was very rapid, showing a two-step release pattern with a rapid initial burst release and a subsequent relatively slower sustained release over five days. The initial burst observed in the first 6 h released around 70% of the dye, thereafter remaining almost constant throughout the next five days. Indeed, this is consistent with the low solubility of FITC in acetone. 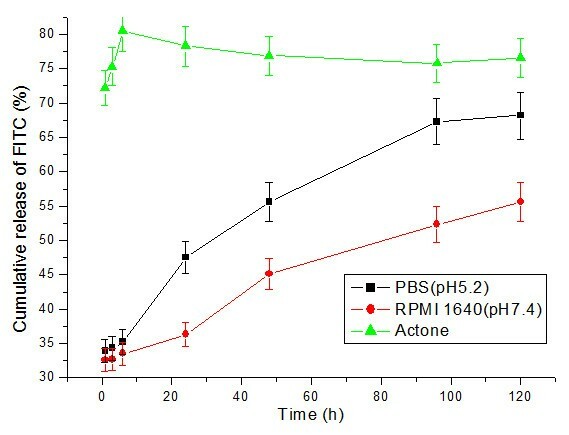 However, different dye release kinetics was observed from FITC-loaded HMSNs soaked in PBS (pH5.2) and cell culture medium. Initial burst released only around 33.9 and 32.6% of the dye from HMSNs soaked in PBS (pH5.2) and RPMI 1640 medium, respectively. Following this, FITC was observed to be gradually released from particles soaked in these two liquids. At the end of five days, the cumulative amount of released FITC reached a value of 68.2 and 55.6% in PBS (pH5.2) and cell culture medium, respectively. Indeed, these were lower than that released in acetone and thus could suggest that FITC slow release from the HMSNs in cell culture medium would reduce its loss from the porous particles before the latter's entry into cells. Meanwhile, this also implies that the use of HMSNs as a drug carrier could ensure that the drug cargo is released into the cytoplasm in a slow fashion, thus appropriate for a sustained drug effect. Furthermore, recent reports on the design of functional mesoporous silica materials that have their pore surface decorated with organic or inorganic moieties to serve as gating devices that can regulate the release of guest molecules under the control of several different external stimuli, such as chemicals [26–29], temperature , redox reactions [31, 32], and photoirradiation [33, 34], have highlighted the potential of utilizing such kind of nanodevice for diverse controlled release applications. Indeed, this could be incorporated in our future work for controlled release of our HMSNs by utilizing such different moieties. Cumulative release kinetics of FITC from HMSNs in different solutions. Non-Radioactive Cell Proliferation Assay [(3-(4,5-dimethylthiazol-2yl)-5-(3-carboxymethoxyphenyl)-2-(4-sulfophenyl)-2H-tetra zolium, inner sath; MTS) was used to determine the proliferation and viability of cells that has been treated with different concentrations of the nanoparticles. Figure 5 shows the densities of cells cultured with different concentrations of HMSNs for 24 and 48 h. Even though cell viability was observed to decrease as a function of concentration and time, it was noted that none of the cell samples reached below 70% of viability. As such, this indicates that even at a high concentration of 2000 μg/mL, the nanoparticles exert no significant cytotoxic effect on the cells and thus presents as a safe and ideal delivery vehicle or chemical/drugs into cells. Influence of different concentrations of HMSNs on the cell viability of Hela cells. The uptake of FITC- mesoporous silica nanoparticles by HeLa cells was confirmed by confocal fluorescence microscopy. FITC-loaded HMSNs were passively loaded into Hela cells by incubating them with 100 μg/mL of the nanoparticles. 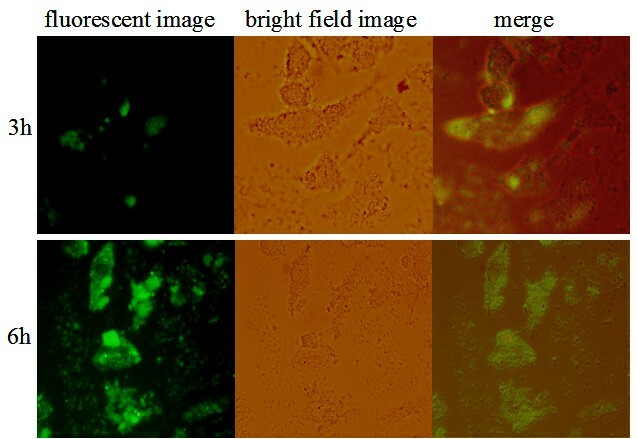 Figure 6 shows that the HMSNs were endocytosed into cells as early as 3 h after exposure to the nanoparticles and a progressive increase in fluorescence emitted by nanoparticle-labelled cells was observed with increased in time point. The fact that nanoparticles uptake by Hela cells was significantly higher at 6 h as compared to 3 h of incubation highlights the time-dependent accumulation of these nanoparticles within the cells. Recently, it was demonstrated that particle size determines the mechanism and rate of intracellular uptake as well as ability of the particle to permeate through tissue [35, 36]. Indeed, the size of a particle can affect the efficiency and pathway of its cellular uptake by influencing their adhesion and interaction with cells . For biomedical applications, the control of pore size, morphology, and particle size of ordered mesoporous silica is thus important. Compared to bulky mesoporous silica materials, which have sizes above a micrometer, nanometer-sized mesoporous silica particles (30 to 500 nm) are better transporters since they have a fast mass transport, effective adhesion to substrates, and good suspension in solution. In this report, the size of mesoporous silica nanoparticles of about 200 nm in diameter, is therefore ideal for cellular uptake. It is expected that the size effect on cell uptake would lead to size-dependent biochemical responses . The detailed downstream cell response, however, needs further in depth study. Uptake of HMSNs into Hela cells at different time points. To determine whether the FITC-loaded HMSNs could escape the endosomal entrapment, we stained the endosomes with a red fluorescent antibody and monitored the distribution of FITC loaded HMSNs in HeLa cells by confocal fluorescence micrographs. The yellow fluorescent spots (indicative of a merged between the red and green spots) observed in Figure 7 represent the FITC-loaded HMSNs that has remained trapped in endosomes, while those that were released from the endosomes exhibited a green color. This clearly shows that the FITC-HMSNs could escape the endosomal compartment efficiently within a few hours of endocytosis. Interestingly, several red spots with no overlapping fluorescence from the green FITC-HMSNs were also observed in the cell. This could either be endosomes that have not harbour any FITC-mesoporous silica nanoparticles in them or those that have already emptied their nanoparticulate contents into the cytoplasm. Cellular release of FITC-loaded HMSNs from endosomes in Hela cells. (a) FITC-loaded HMSNs; (b) endosomes; (c) bright field image; (d) merge. To further confirm release of HMSNs from the endosomes, cells were incubated with FITC-loaded HMSNs and their intracellular localization was investigated by TEM at 3 h time point. The results as shown in Figure 8c demonstrate that HMSNs adhered to the plasma membrane were subsequently internalized by a vesicle-mediated endocytosis process. This is evident by appearance of some cytoplasmic vacuoles harbouring non-clustered nanoparticles in Figure 8c-d. Additionally, nanoparticles located outside the endosomes were also observed as shown in Figure 8d., which is consistent with the previous result obtained by confocal fluorescence microscopy. This further emphasizes the fact that HMSNs are able to escape the endolysosomal entrapment in just a short period of time after their intracellular uptake. At all phases of HMSNs interaction with cells, the particles predominantly maintained their uniformity in shape and showed absence of aggregate formation. Therefore, these particles could serve not only as vehicles for introducing drugs/chemicals into cells, but are also capable of releasing their cargo into the cytoplasm. Nonetheless, the detailed mechanism on the escape of these particles from the endosomes is not yet clearly elucidated and warrants further research works. Transmission electron micrographs of Hela cells treated for 3 h with FITC-loaded HMSNs. 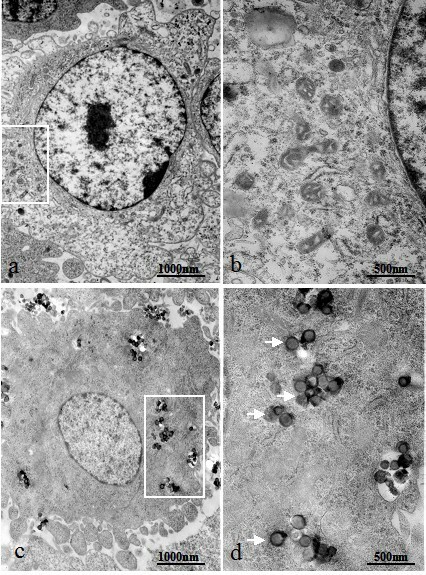 (a) Untreated cells; (b) Magnified regions of endosomes in (a) at higher power; (c) Cells treated with FITC-loaded nanoparticles; (d) Magnified regions of endosomes in (b) at higher power; White arrows indicate particles that has been released from the endosomes. Hollow mesoporous silica spheres were prepared by a sol-gel/emulsion (oil-in-water/ethanol) method wherein hydrated silica gel was formed on the surface of HMSNs. This surface layer had a mesoporous structure, with a pore diameter of about 2 nm. FITC adsorption studies revealed that HMSNs had a high adsorption capacity for FITC at high concentration of the nanoparticles. Their release kinetics showed that FITC adsorbed onto these HMSNs could be released continually over one week in inorganic solution, whereas a burst release kinetics of the fluorescent dye was observed just within a few hours in organic solution. The synthesized nanoparticles also showed good biocompatibility with Hela cells wherein they show ability to be released from the endosomal compartment after intracellular uptake by endocytosis. In summary, this work demonstrated the potential of producing HMSNs as a carrier for protein/drug delivery for imaging and other biomedical applications. HMSNs were synthesized by the ammonia-catalyzed hydrolysis and condensation of TEOS in mixed ethanol-water solvents, with CTAB used as a surfactant. TEOS and CTAB were first dispersed in 13 mL 95% ethanol and 27.5 mL water. 25% ammonia solution was then added after diluting it with ethanol, and this was kept stirring at 700 rpm for 3 h. When the reaction was completed, the resultant products were collected by centrifugation and washed with water. Finally the stable spheres with hollow structure were obtained by calcinations at 200°C with an increment rate of 5°C/min for 6 h and then at 600°C for 6 h.
Transmission Electron Microscopy (TEM) images were recorded on a JEOL 2010 transmission electron microscope operated at an acceleration voltage of 200 kV. Samples for TEM measurements were prepared by dipping a drop of the colloidal solution onto Formvar coated copper grids. Scanning Electron Microscopy (SEM) images were taken on a Shimadzu SSX-550 field emission scanning electron microscope at 15.0 kV. N2 adsorption-desorption isotherm measurements were carried out on a Quantachrome Autosorb-1 pore analyzer at 77 K under a continuous adsorption condition. Samples were degassed at 200°C for 6 h before taking the measurements. Brunauer-Emmett- Teller (BET) analyses was used to determine the surface areas and pore sizes of the products. FITC was used as a model drug and the effect of different particle concentration on drug loading was studied. 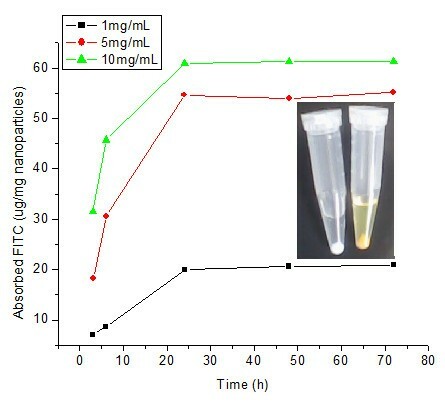 Different concentrations of HMSNs (1, 5 and 10 mg/mL) were mixed with 1 mL of 1 mg/mL FITC in acetone solution. The mixture was then incubated for different time duration at ambient temperature, followed by centrifugation at 5000 rpm for 5 min. FITC was quantified, using a UV-vis spectrophotometer, according to its absorbance peak at 488 nm. Raw data were converted to concentration (μg/mg) of FITC using the standard curves obtained at different time point. The FITC-loaded HMSNs, obtained as described in section 2.4, were mixed with 1 mL of RPMI 1640 medium (pH 7.4), acetone or PBS (pH 5.2) and left incubated at ambient temperature under gentle shaking. A 100 μL aliquot of supernatant was removed at a given time after centrifugation at 5000 rpm for 5 min and this was supplemented with 100 μL of fresh PBS, acetone or RPMI 1640 medium, respectively. The absorbance of FITC at 488 nm was recorded, and the cumulative release of FITC was calculated. One-way ANOVA and Duncan's multiple-range test for post hoc comparisons were carried out, and α = 0.05 significant level was used. Hela cells were cultured in RPMI-1640 medium (Gibco, Life Technologies, Vienna,Austria) supplemented with 10% fetal bovine serum (Gibco, Life Technologies,Vienna, Austria), 100 U/mL penicillin and 0.1 mg/mL streptomycin (Geneticin, GibcoBRL life Technology, Inc). Cells were maintained at 37 °C in a humidified 5% CO2atmosphere. For MTS assay, Hela cells were collected and diluted to a density of 1×105 cells/mL in complete medium, and then seeded onto 96-well plates (100 μL/well). After an overnight culture of 24 h, nanoparticles of different concentrations(50,100, 200, 500, 1000, 1500, 2000 ug/mL) were added to the cells and then incubated for another 24 or 48 h at 37 °C. Its viability was assessed using the Cell Titer 96 aqueous one solution assay (Promega, Madison, WI). The reagent contains tetrazolium compound [3-(4,5-dimethylthiazol-2yl)-5-(3-carboxymethoxyphenyl)-2-(4-sulfophenyl)-2H-tetra zolium, inner sath; MTS]. The relative cell viability (%) related to control wells containing cell culture medium without nanocrystals was calculated by [A]expt/[A]control × 100, where [A]expt is the absorbance of the test sample and [A]control is the absorbance of control sample. Loaded with FITC were added and the cells were incubated for varying times (3 and 6 h). The cells were imaged in bright field and under UV infrared excitation using a Nikon confocal microscope. Hela cells were grown overnight on glass-bottom culture dishes (MattekTM), and then incubated with culture medium containing 100 μg/mL of FITC-loaded HMSNs for 3 h at 37°C. 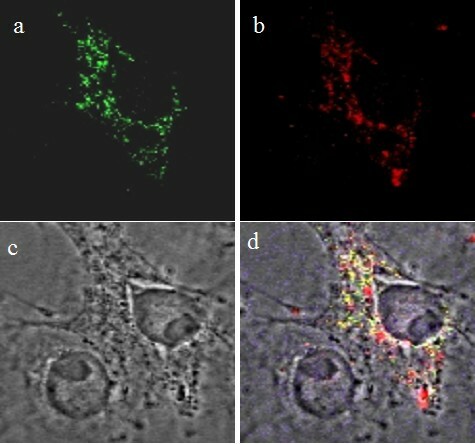 Release of FITC-loaded nanoparticles from the endosomes were imaged by staining the endosomes with a rabbit polyclonal antibody to EEA1 (early endosome marker, Molecular Probe) and visualized with Alexa Fluor 568 goat anti-rabbit secondary antibody (Molecular Probe). The stained cells were then imaged using a Zeiss LSM 510 laser-scanning microscope (Thornwood, New York). Images were captured using the Evolution MP Cooled Camera Kit (Corporate Headquarters, MD, USA). To acquire TEM images of the cells, they were fixed with 2.5% glutaraldehyde (Electron Microscopy Sciences) in 0.1 M sodium cacodylate (Ted PellaTM) buffer (pH 7.3) for 20 min at room temperature. This was followed by washing with 0.1% cacodylate buffer, and postfixing with 1% osmium tetroxide (Electron Microscopy Sciences) solution for 30 min. Subsequently, the cells were counterstained with 4% uranyl acetate (Electron Microscopy Sciences) for 30 min, washed with distilled water, dehydrated in 100% ethanol, and embedded in DurcupanTM ACM resin (FlukaTM). This work was supported by the ministry of science and technology of China (No.2008FY130100) and science and technology committee of Gansu(No.1002NKDA037). HG has made substantial contributions to conception and design, acquisition of data, analysis and interpretation of data, involved in drafting the manuscript and revising it critically for important intellectual content. HQ, DS, JW, JT involved in acquisition of data, analysis and interpretation of data. ZL, HY, XC, XL, SS revised it critically for important intellectual content; and have given final approval of the version to be published.